Opinion Outpost Review 2018 – Is it a Legit or Scam? Welcome to my Opinion Outpost review! Opinion Outpost claims that you can make money just by giving your opinions online. Is it really that easy? Is Opinion Outpost worth your time? And most importantly, is it a legit or a scam? That’s all I will be covering in this Opinion Outpost review. Summary: Opinion Outpost is a popular survey site that pays its members for giving their opinions. Opinion Outpost is a part of Survey Sampling International, LLC and has been around for more than a decade. It is a legitimate market research and survey taking company that pay members for completing daily surveys. In other words it is a community where members are rewarded based on their opinions on different products and services in the form of surveys. There are lot of survey sites but it is most widely used site and its popularity is increasing day by day. It is free to join and available to USA and UK members. It uses a point based system and reward members points and when they reach withdrawal limit then can request through PayPal account. Opinion Outpost reward you mostly between 10 to 50 points per completed survey and some has even less and greater than this limit. Each 100 points worth is equal to $10. Each survey has its own reward but longer the survey, high the price will be. If you want to know more about other similar survey companies then go to following reviews: Inbox Dollars, My Survey and Swagbucks. First you need to register with Opinion Outpost. This process is simple but it requires you to provide your personal information like name, gender, email id, location, date of birth, occupation etc. This help the company to place in a specific category of people and allowed the advertisers to reach you with targeted survey questions. In order to get paid you must agree their terms and conditions to provide your personal information. Once you have provided the above said information then the Opinion Outpost Company will reach you through email that provide you invitations about surveys and panel promotions. Other than email you can also see pending surveys when you login to your account. You can access these questionnaire by PC, laptop or mobile device. Once you complete the survey then it will take some time to get approved and you are credited points in your account. If you want to earn high then complete all surveys and in this you only earn from your survey rewards but also can win a quarterly contest of $10,000. As I mentioned above, Opinion Outpost is using a points system to rewards its members and 10 points equal to $1. There are different options available to convert those points but the most popular are PayPal and Amazon gift card. PayPal withdrawal limit is $10 (100 points), while $5 (50) for amazon gift cards. Other than these two methods you can also use iTunes gift card for $5 (50 points) and you can also donate your points to American Red Cross as both have partnered in the said subject. Each survey on average, will reward you about $0.50 to $2 and it can take up to 10 to 50 minutes. I have seen majority of members are earning $10 to $35 per month. ​Opinion Outpost is free to join for everyone. 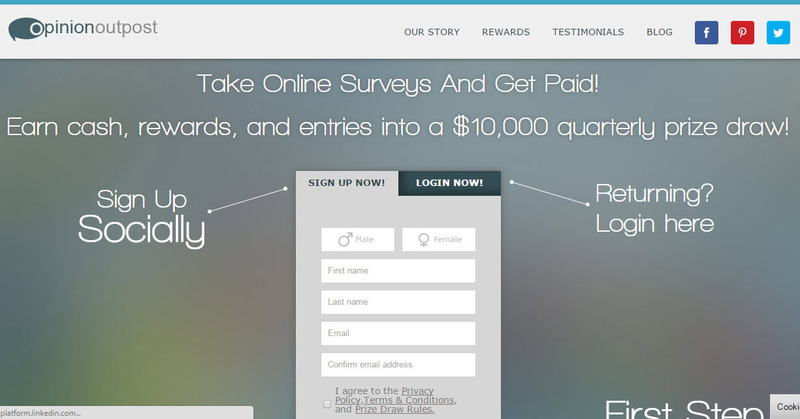 Very trusted and old site among survey industry that are paying to its members. You can earn some additional income from home if you complete surveys daily. If you put effort on completing surveys then the person who has completed the most surveys in the quarter will be rewarded $10,000. It means every year company awarded $40,000 to 4 persons for completing the highest number of surveys. Want to Earn a Fulltime Income From Home? Surveys can only be used as a side income, if you want a much bigger income than this to make a living around i recommend you to see my #1 recommendation. See My #1 Recommendation Here! You cannot earn $30 to 50 per survey completion as it is popular among the people. Very few people have found survey compensation more than $10. Most of the surveys rewards you few cents to couple of bucks. It takes about 20 to 30 minutes to complete one survey and you on average earn $1 which means your hourly income is $2. You cannot even find surveys all days and sometime there are no surveys available. Earning $20 to $100 per month is not much and you have to find some other ways to earn full time income. Very often you find that after competing pre-qualification questionnaires, you won’t be eligible to complete the actual surveys. This is very common problem among survey companies. What this means is that after spending 10 to 30 minutes on pre-qualification questions you earn nothing. It just add misery to your life and a waste of time. Sometime you don’t receive any survey at all. Companies target specific group of people and if your profile don’t match to their requirements then you just wait for next survey. You will have to provide your confidential information in order to earn money. This can be very risky and providing your email and telephone numbers to anyone can face you spam messages and calls. There are other issues that members are facing as well like account frozen, syntax errors, survey is full, no surveys, violation of terms and conditions etc. In last one year members complaints have increased tremendously. Only surveys available for people of USA and UK members. In short Opinion Outpost is a legit company that has been paying for years to its members and you can earn few bucks per month. It can be good for those who have no other earning opportunity and want to join better program and don’t have money so they can earn from this and other survey sites and start regular online income. It is a good company but it does have limitations that can be really annoying and also if you are looking for some full time income then opinion outpost is not for you and you have to see some alternate solution. If you want to join opinion outpost then definitely it is better among most survey sites and if you are looking for real long term earning opportunity then see my #1 recommended business known as Wealthy Affiliate. I hope you will like my opinion outpost review and if you have any question about this product then please ask in comment section and i will be very pleased to answer it. I hope you will like my Opinion Outpost review and if there is any question in your mind, please ask me in the comment section. Smart Dollar Club Review – Is it Real Survey Site or Scam?